The 2014 Chevy Spark is Chevy’s most elaborate city car that Chevrolet has ever built. Made for the city slicker, the new Spark is compact, and full of room for you, your passengers and your cargo. On the outside, it may not seem like there’s a lot of room, but trust us. As soon as you open the door and sit inside a Spark, you’ll realize how much room there really is. With over 31 cubic feet of cargo space, the 2-door Spark is sure please both your eye and your wallet. Parking is never difficult in the Chevy Spark—you’ll be able to park in places you just wouldn’t be able to with a bigger car or SUV. The Spark was named a “Coolest New Car under $18,000 of 2013” by Kelley Blue Book. If you like fun, if you like technology, and you like saving money, the 2014 Spark is the car for you. Be the one with the cool car. The Spark may be smaller than most Chevy models, but that doesn’t mean there isn’t a lot of room for you, your family, friends, and lots of cargo space. 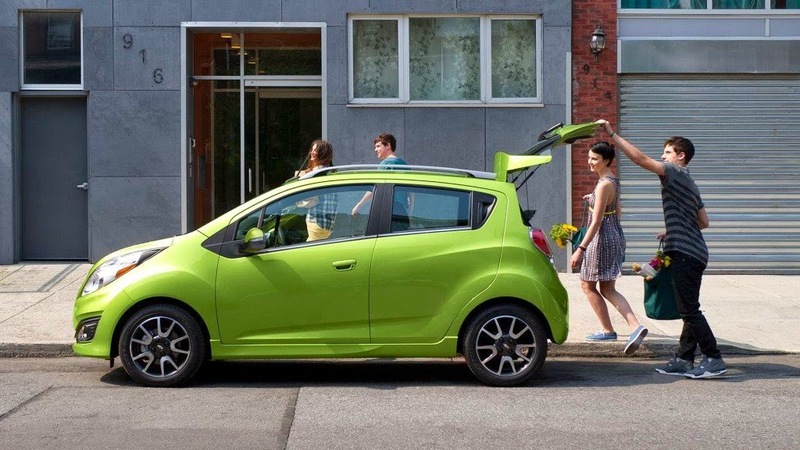 The Spark has an EPA-estimated fuel economy of 31 MPG city and 39 MPG highway. The vehicle measures in at 144.7” long and 61.0” tall. Your selection of details can vary depending on the style of Spark you’re looking for. The Spark LS, Spark 1LT and Spark 2LT each have their own unique feel, and special features. From heated, power-adjustable mirrors with turn signal indicators to cruise control, SiriusXM Satellite Radio and Leatherette seats, you’ll find every feature you want, both inside and out. A brand new Chevrolet Spark comes standard with a Chevrolet Complete Care package. What’s a Complete Care package? It’s a huge benefit to being a new Chevrolet owner. Your Spark will be backed by 2 years or 24,000 miles of scheduled maintenance, certain warranty coverage, 100,000 miles of roadside assistance and more. The Chevrolet Complete Care program has more benefits that will help you save money, keep you on the road and keep your Spark in the best condition. Chevy’s Complete Care program is number one compared to any other manufacturer’s benefits. Click here to view our complete Chevy Spark inventory.